This little monster combines uses two mods; one discovered by soulsonic of freestompboxes.org, and one that I found while poking around. [click for larger]Soulsonic's mod turns this crappy, single-speed echo into a surprisingly decent variable-speed delay pedal! Simply locate pin 6 of the PT2399S, remove the attached resistor labelled "682" and replace with a pot and resistor. Soulsonic reccomends a 50k pot and 180 ohm resistor, but I used a 100k pot and 220 ohm resistor. [click for larger]The second mod is a feedback loop connecting the bottom two wires pictured above with two different capacitor selections to create a wave effect in the drone. With this mod, I also added a 100k "feedback strength" pot, and a switch so you can throw it into standalone mode without anything plugged in (top two wires in the picture above). [click for larger]When these two mods are combined, the BLT is so much fun to play with! There are 5 controls, mix, repeat, sample length, feedback strength and feedback mode (A/off/B). As a standalone drone device, it packs a powerful punch. The sample-length mod creates some great pitch swoops and I once managed to make it sound EXACTLY like a turntable scratch! Unfortunately I wasn't able to reproduce that in this video. Here are some odd sounds I found while adding better controls to an Epiphone Headjammer (a little headphone amplifier for your guitar). I added higher pots and better switches, and now it just makes an assortment of fantastic noises and feedback squelches when there is no signal running through it. You can control the sounds with the pots and switches, but mainly by moving your hands around in the air above the Headjammer. I had to record this, just in case it doesn't happen again when I case the thing back up. 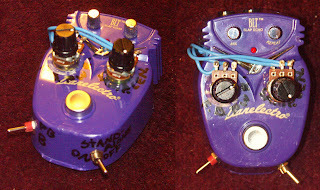 PS: This weekend I will post about turning my crappy Danelectro BLT Echo into a multi-speed delay pedal, as well as a standalone drone-machine. Stay Tuned!